• During its original mission, the Enterprise, Captain Kirk, and his intrepid crew visited many strange new worlds and discovered many new life-forms and civilizations. • Now, you and your friends can boldly go and explore this galaxy, too, with the Star Trek: Catan - Federation Space Map Set, which includes two maps depicting the Known Galaxy. 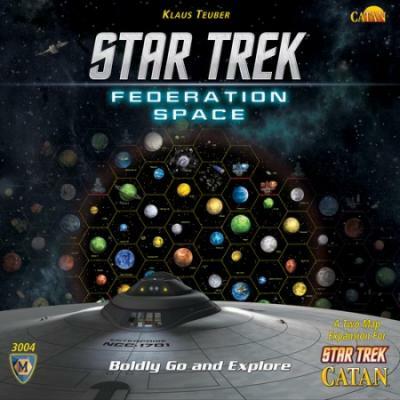 • Based on the "Explored Galaxy" map seen in Kirk's quarters itself, these maps allow you to settle the famous worlds of Federation Space using pieces from your Star Trek: Catan base game.